Tea brack — a.k.a. 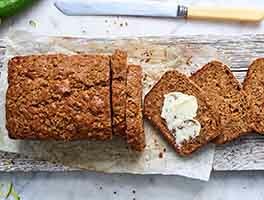 Irish Freckle Bread — is a moist, close-grained, packed-with-fruit breakfast bread. 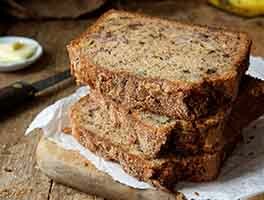 Based on Ireland's classic yeasted barm brack, this quicker version is just as popular in that country, where its only sweetness comes from the raisins and sultanas it's packed with. Our Americanized version adds brown sugar plus additional fruit (prunes and dates). 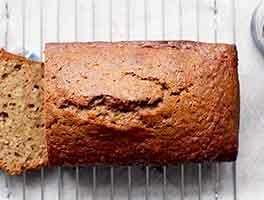 Like the original Irish tea brack, though, the fruit is soaked in brewed tea, which is the bread's only liquid. If desired, substitute 2 tablespoons Irish whiskey for an equal amount of the tea. 2 hrs 20 mins. to 2 hrs 25 mins. Preheat the oven to 325°F. Lightly grease an 8" x 2" round cake pan. If your pan isn't at least 2" deep, use a 9" round pan. Add the dried fruit, and any remaining liquid. Stir until thoroughly combined; the batter will be thick and stiff. Add the egg, mixing until thoroughly combined. Bake the bread for 60 to 70 minutes, until a cake tester inserted in the center comes out moist, but without clinging crumbs. I noticed that some reviews mentioned whiskey or other liquors I did not see this in recipe ? How much or is that included in place of the Irish tea? 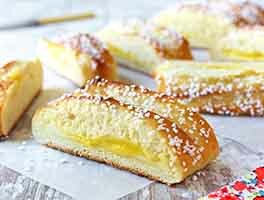 I make this at Christmas time for our holiday bake. We serve it fresh the day it is baked as dessert and freeze it for enjoying later. It freezes beautifully and the flavor is just as tasty as the day it was made. Shades of Grandma's kitchen! 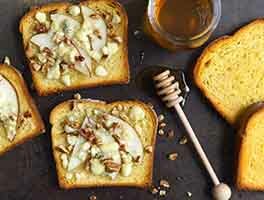 This recipe is easy, delicious and quick to make. Very authentic to the texture, taste and memory I have of this stable of Irish homes. I used a loaf pan to achieve the homestyle appearance this bread is usually presented in. My first use of King Arthur's recipes and it is a winner! Thank you! Delicious alternative to a Christmas fruitcake. I made this as written, but without the sparkling sugar. Next time, I will try reducing the amount of added brown sugar, or replacing it with a little molasses or honey. As is, it is tasty, but very, very sweet. I will say, if you don't like tea, dried fruit, or fruitcake, you will not like this recipe. I have been making this for several years now. I take it to a volunteer group that loves goodies. We are all senior citizens so this is a good recipe for us since it has all the fruit in it. I love to have it with my morning cup of hot tea and then for my 4pm tea time! Easy to change depending on what dried fruit you have on hand. I followed recipe except I substituted apricots for prunes and used golden raisins since it already had currents. It is a substantive cake, a little goes a long way, it is a bit of a mini meal and it goes very well with a nice cup of tea. I was surprised how moist it was considering there is no fat or oil in the mix. Sparkling sugar on top pulls the cake together. After reading some of the tweaks I will give them a try next time. 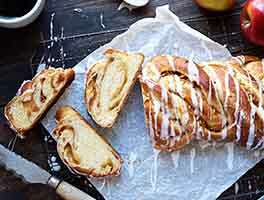 Can this recipe be modified so that my grandson who is on dairy free and gluten free diet could enjoy it? He also tends to have problems with intestinal motility so plenty of fiber is beneficial. Tea Brack has just become a new family favorite...the flavor unique and difficult to walk past without snatching one more piece. The coarse sugar on top adds a terrific crunchy texture contrast; don't skimp there. I made this for a St Paddy's Day open house...doubled the recipe and baked in three 8x1' pans resulting in tidy little sample portions.